As its gunmetal why not slice it down the middle and solder back together and add a bit of height where required at the same time. Not a good idea as Bottom cover which slides within the sides of the Cistern is also over sized and if you reduced the width of the cistern it would fall over the outside. No it is another of those cases of identifying the mating surfaces and making them match each other and hopefully getting equal material where needed. The bottom cover goes on the bottom of the cylinder. 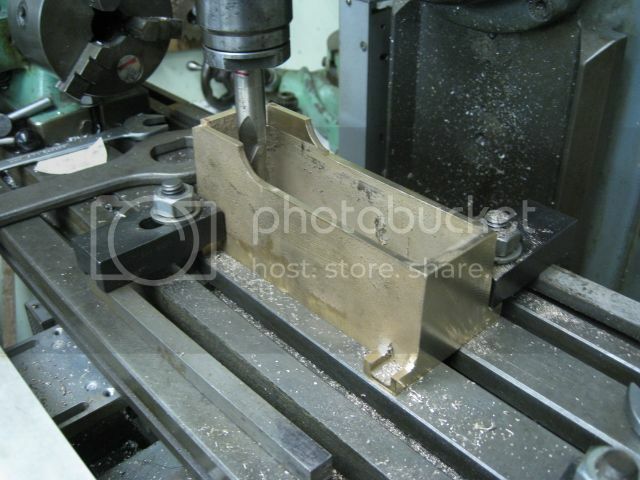 Or as it is a casting, for which no measurements are critical, find a measurement that all the castings will work for . It was next clamped onto a rather large angle plate and the two ends cut flat and square. Using the reference base and the same end it was now possible to square up the casting, machine the top to height (or below height as the casting allowed ) mill the tops of the stands deep inside the cistern for the condenser and to take the outside brackets to height. At the far end on the top you may just about be able to see that I have also taken out the two corners this is to add some ears as part of the next stage. I also milled the insides of the part just under the cylinder to take the bottom cover. Being quite the novice at machining castings I have a question. 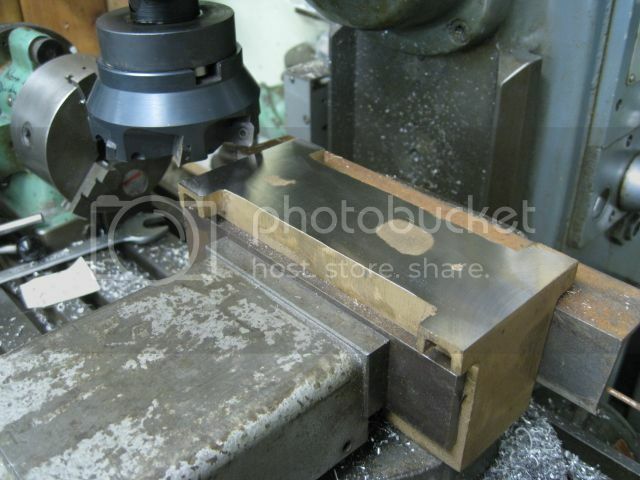 Since the base of the base is going to be your reference plane, machining it seems critical to me. How do you align the casting in the vise to ensure you'll have enough material on the other sides to machine those surfaces true? Normally with any casting one fiddles about with it to see if it is suitable to be machined, (i.e. its not too small and the observable surfaces have no blow holes etc.). Next a suitable datum is determined and marked on the casting. The casting is set up for machining using the datum line/points for reference. In Jo's case where the 1st cut is to mill a base a second line would be offset from the datum and the casting set up to this line then milled to the line. Once the base is machined the casting is returned to the marking off table and everything re-measured from this new datum. Yes as Bob says I had to fiddle around with it balance this bit being over sized and that bit under. My final decision was actually where someone had already had an attempt at squaring up the bottom it was within 0.5mm of where it needed to be as a starting point. Don't think they make the 1/2 round beading down to 1/16" so its out with the file to round off the side of some flat strip then fit that to the top of the casting, thats why I queried if you had allowed for that strip when you said the sides were low as it effectively adds 1/16" to them. Having said that I think I enjoy the fabrication more than working from castings so can see me going more down that route unless its something very desirable. Don't think I'll get to do any on the Otto until over xmas, thats if I don't work with a client being away for 3 weeks its tempting to get on in the empty house.